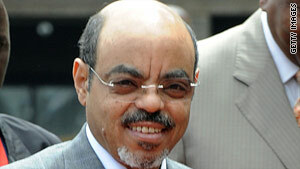 Ethiopian Prime Minister Meles Zenawi says the U.S.-funded Voice of America engages in "destabilizing propaganda." Ethiopia wants to jam VOA broadcasts for service's "destabilizing propaganda"
U.S. calls country's accusations "baseless and inflammatory"
(CNN) -- American officials have condemned plans by the Ethiopian prime minister to block U.S.-funded Voice of America broadcasts in Amharic, the main local language. Ethiopian Prime Minister Meles Zenawi accused the media organization of "engaging in destabilizing propaganda," according to the Committee to Protect Journalists. Zenawi said Thursday that he would allow efforts to jam the network's broadcasts, according to the press freedom advocacy group. He compared the VOA to a Rwandan radio station accused of stoking the 1994 genocide that killed about 800,000 people. A U.S. State Department spokesman condemned the accusation. "Comparing a respected and professional news service to a group that called for genocide in Rwanda is a baseless and inflammatory accusation that seeks only to deflect attention away from the core issue," spokesman Gordon Duguid said. The Ethiopian government may disagree with VOA news, but interfering with its broadcasts undermines the nation's constitutional commitment to censorship and freedom of expression, he added. "This right shall include freedom to seek, receive and impart information and ideas of all kinds, regardless of frontiers," Duguid said. VOA said its Amharic language listeners have experienced interference since February. Its other broadcasts in the Horn of Africa nation have not been affected. The U.S. government funds the media service, which broadcasts news and other programming in different languages worldwide. Press freedom advocacy groups have said Ethiopia is trying to limit media coverage leading up to the May elections, an accusation the government denies.